Swimming with Whale Sharks on Ningaloo – A Bucket List Experience! Ticking an item off your bucket list is not only fulfilling, it can be highly emotional, exciting and, for some, even life-defining! At Exmouth Dive & Whale Sharks Ningaloo, we feel very fortunate to be instrumental in helping make people’s dreams come true. For many, swimming with whale sharks is a giant tick off their bucket list! But what is it that makes an up-close encounter with whale sharks so special? Why does swimming with these gentle giants feature at the top of many people’s ‘must do’ once-in-a-lifetime experiences? As the Coral Coast’s longest-running operator of adventure snorkel tours, we’ve been taking guests out to Ningaloo Reef every whale shark season since 1994. The daily pleasure of helping people live their dream, and sharing in their experience, has given us a real understanding of the appeal and allure of swimming alongside the world’s largest fish. You can only swim with whale sharks at a handful of places around the world – including right here at Ningaloo! Our reef’s remarkable eco system attracts hundreds of whale sharks. They gather en masse annually between March and August to take advantage of abundant feeding, making the Coral Coast one of the world’s most populated – and accessible – whale shark hotspots. For some, it’s as much about the North West Cape destination itself that’s the draw card. Our whale shark swims take place in World-heritage listed Ningaloo Marine Park, the world’s largest fringing reef at 260kms. It’s home to over 450 different species of marine life, and 250 different species of coral, making it a snorkeller’s paradise. Some describe sharing the water with creatures as magnificent as whale sharks as a spiritual experience. Being close to such large and majestic creatures in such an untouched environment can bring a unique perspective to they way some people view themselves and their place in the world. Whatever the reasons, we view helping people make such a massive tick off their bucket list as an honour and a privilege. Our guests range in age from six years upwards, and represent people of every demograph. 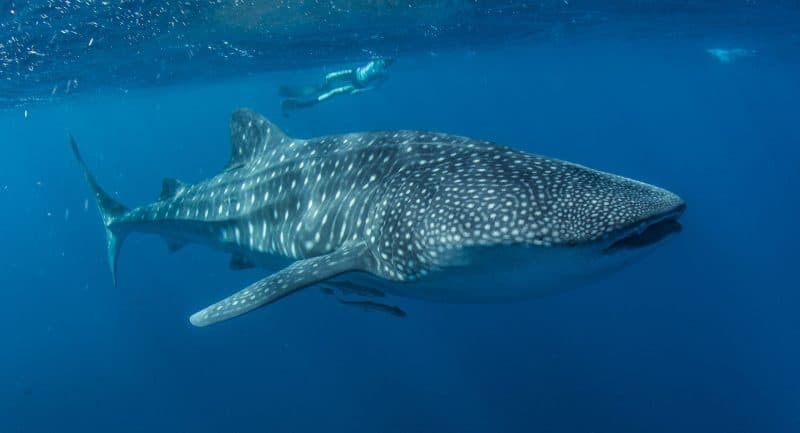 From honeymooners to backpackers, to extended families, tour groups, and dive enthusiasts, and local folk through to interstate and international tourists, Exmouth Dive and Whale Sharks Ningaloo gives everyone the whale shark experience of a lifetime. From the moment you climb aboard one of our customised vessels, you’ll know you’re in for a day of fun-filled adventure and excitement. Our fully-qualified dive masters will already be in communication with our official ‘eye-in-the-sky’ light aircraft whale spotter, and know exactly where to head to maximise your whale shark experience. You’ll get ample time to swim alongside whale sharks in the warm crystal waters of Ningaloo, where you’re guaranteed to spot countless other species of marine life and coral. Everything you need is fully provided from quality gear and equipment through to delicious lunch, beverages and morning and afternoon tea. At the end of the day we’ll deliver you back to shore exhilarated from your whale shark encounter, and with memories to cherish for a lifetime. Don’t say ‘one day’ … make a tick off your bucket list today with one of our regular or deluxe Exmouth Whale Shark Swim Tours. You’ll find full details of each of our personalised ‘must do’ tours here. 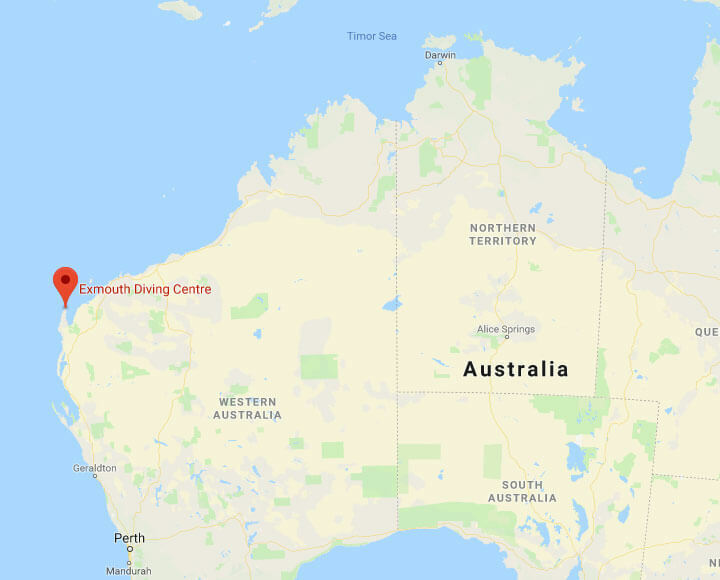 Exmouth Dive & Whalesharks Ningaloo has been operating for many years on the Ningaloo Reef and is Exmouth’s original dive centre. We specialise in WhaleShark Swim Tours, Scuba Diving, Snorkelling and having a great time on the Ningaloo Reef. Contact us to help you plan your perfect Exmouth & Ningaloo experience.